So how do you mitigate some of the dangers on Craigslist? MEET IN A HIGHLY PUBLIC PLACE, PREFERABLY DURING THE DAY. 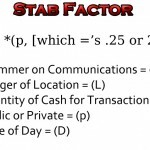 Remember when I mentioned the “Stab Factor” – it gets multiplied by 3 if it’s at night, 2 if it’s a private location, and 15 if there are large sums of money involved. Meeting a guy with a large sum of money on you at his home at 11pm – your chances of getting stabbed are about +9000%. Here is a basic “Stab Factor” equation below. For more resources consult your local library. Dealing with a lot of money? Tell them to meet you at your bank during business hours. It isn’t rocket science, but you need to understand that people do get robbed, scammed, and hurt through Craigslist. If you see posts with great prices and an unfamiliar local city – Its probably just an e-mail collector. You email them, they store and/or sell your e-mail address. It’s not a bad idea to use a separate e-mail account for craigslist. If you are selling an item, be sure not to fall for a send-a-way scam. People will state they need you to ship the item and will pay you via Paypal. These are 99.99% of the time, scammers. Craigslist is made for local buying and selling – leave it at that.